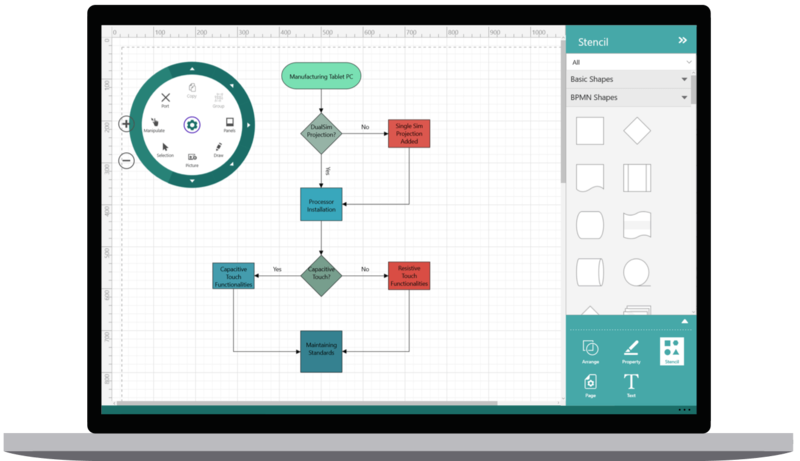 The UWP Diagram control allows users to quickly create and edit flowcharts, organizational charts, UML diagrams, swim lane charts, mind maps, floor plans, circuit, network, entity relationship, and more within your UWP applications. The UWP Diagram control provides all the standard flowchart shapes as ready-made objects to build flowcharts, making it is easy to add them to a diagram surface in a single call. Quickly load large diagrams using UI-virtualization techniques, which selectively loads only the objects that lie within the viewport area. Smooth scrolling performance is achieved using a built-in spatial search algorithm that builds an index based on the element position. Visualize any graphical object using nodes, which can also be arranged and manipulated on a diagram page. Shapes: Use 40+ standard built-in shapes or your own custom shapes. Template: You can use text, image, controls, panels, or any UIElement or template to visualize a node. It can also be bound to any of your business objects. A connector is used to represent a relationship between two nodes. Some of the key features are listed below. Types: There are Straight, Orthogonal, Curved types of connectors. You can choose any of these based on the type of diagram or relationship between the connected notes. Arrowheads: Use arrowheads (decorator) to indicate the flow direction in a flowchart or state diagram. You can also build your own custom arrowheads, based on the type of diagram. Routing: Orthogonal connectors take shortest and smart path that avoids overlapping with any neighboring nodes. Bridging (line jumps): Bridging (line jumps) clearly indicates connector’s route and makes it easier to read where connectors overlap with each other in a dense diagram. Connect to desired places of a node through different types of ports or connecting points available. Show additional information by adding text or labels on nodes and connectors. Drag, Resize, Rotate: Select one or more nodes, connectors, or annotations and edit them using thumbs or handlers. Snapping: Precisely align nodes, connectors, and annotations while dragging, just by snapping to the nearest gridlines or objects. Undo Redo: Don’t worry when your edit ends up being a mistake. Undo and redo commands help you easily correct recent changes. Clipboard: Cut, copy, paste, or duplicate selected objects within and across diagrams. Alignment: Our UWP Diagram control has predefined alignment commands that enable you to align the selected objects nodes and connectors with respect to the selection boundary. UWP Diagram control provides an automatic layout algorithm, which is used to arrange nodes automatically based on a predefined layout logic. There is built-in support for an organization chart layout, hierarchical tree layout, and radial tree layout. The stencil control is a gallery of reusable symbols and nodes. Drag and drop these symbols onto the surface of the diagram any number of times. Improve the navigation experience when exploring large diagrams using the overview control. It displays a small preview of the full diagram page. It also allows users to perform operations such as zooming and panning within it. UWP Diagram control allows you to populate diagrams with nodes and connectors based on data from data sources. Data in any format can be easily converted, mapped, and consumed in the diagram by setting a few properties, without having to write any code. It also supports loading data from an ObservableCollection, List, or IEnumerable collections. UWP Diagram control supports printing with a print preview option. You can also customize the page size, orientation, page margins, and fit to a single page. Share your diagrams with others by easily exporting as .xps, .png, .jpeg and .bmp file formats. UWP Diagram control provides a page-like appearance to a drawing surface using page size, orientation, and margins.